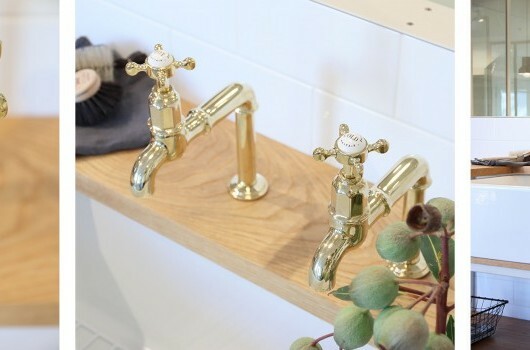 The Perrin & Rowe Parthian mixer tap is ideal for use in the kitchen, bathroom and laundry. The Perrin & Rowe Parthian mixer tap is ideal for use in the kitchen, bathroom and laundry with simple operation via a single white glazed porcelain lever or matching metal lever. In the kitchen, with messy hands, you can nudge the lever in towards the spout to turn it on, then forward for cold and back for hot. All Perrin & Rowe taps feature excellent quarter-turn, German-made ceramic disc valves for many years of accurate and effortless use. They are a great option in kitchens, bathrooms and laundries and suitable for homes with unequal water pressure. 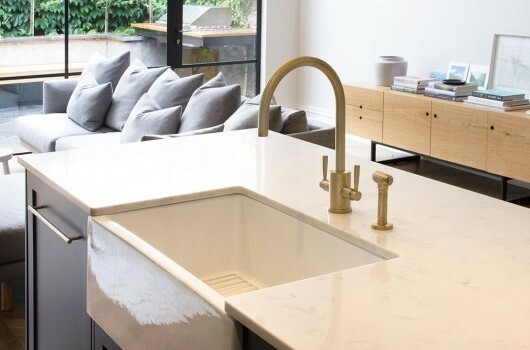 Perrin & Rowe offers Kiwi designers and home owners a wide selection of premium quality finishes. The Parthian taps are available in Chrome, Nickel, Pewter, Gold, and English Bronze finishes. Satin or polished uncoated bare brass also available by special order. The Parthian lever handle can be specified as standard single white glazed porcelain lever, black porcelain or as matching metal lever. English Bronze, Chrome, Brass, Nickel, Pewter taps showing black porcelain handle option. English Bronze, Chrome, Brass, Nickel, Pewter taps showing matching metal handle option. This kitchen by Natalie Du Bois of Du Bois Design was the Supreme winner of the House & Garden Interior of the Year Awards last year, and features Perrin & Rowe Parthian taps in English bronze. NZ House & Garden Supreme Winner & Best Kitchen. Image credit: Du Bois Design. Perrin & Rowe Parthian taps used in the bathroom. Image credit: Neptune UK. The Parthian is available in three models: the standard kitchen mixer, a bar sink model with a shorter reach spout and a kitchen mixer tap with side spray rinse.